Former champions Rafael Nadal and Novak Djokovic battled into the Wimbledon third round yesterday but third seed and 2017 runner-up Marin Cilic crashed out. 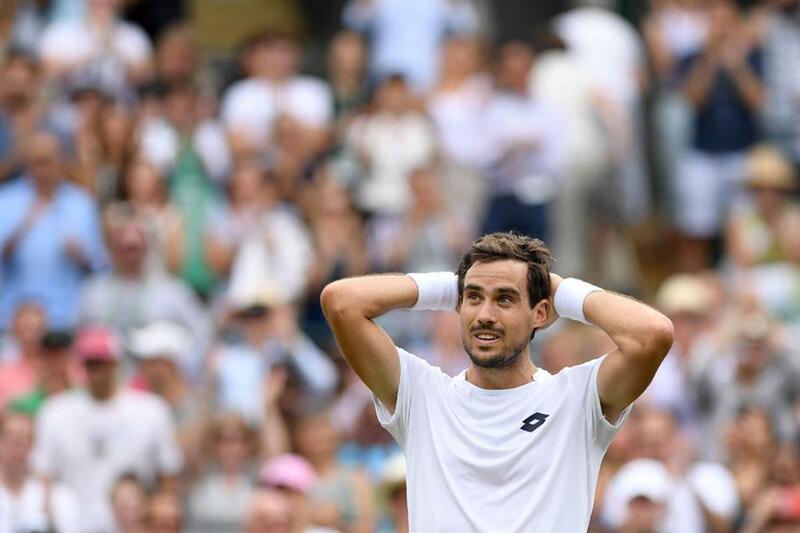 Argentina’s Guido Pella reacts after beating third seed Marin Cilic of Croatia 3-6, 1-6, 6-4, 7-6 (3), 7-5 in their Wimbledon second-round match at the All England Club in Wimbledon, southwest London, yesterday. World No. 1 Nadal defeated Mikhail Kukushkin of Kazakhstan 6-4, 6-3, 6-4 and will next face Australian teenager Alex de Minaur. Cilic blew a two-set lead in his 3-6, 1-6, 6-4, 7-6 (3), 7-5 loss to Argentina’s Guido Pella, ranked at 82. When rain forced the tie to be postponed on Wednesday, Cilic was leading by two sets against an opponent who had never won a match at Wimbledon before this year. But the Croatian collapsed once the match resumed on Court One yesterday and Pella took full advantage to set up a third-round clash with Mackenzie McDonald. Cilic, the 2014 US Open champion, had been expected to mount a strong challenge for the Wimbledon title after winning the grasscourt warm-up at Queen’s Club two weeks ago. Nadal, the 2008 and 2010 champion, was tested by world No. 77 Kukushkin, a player who is coached by his wife. The Kazakh player was made to pay for converting just two of 13 break points in the match on Centre Court. Three-time major winner Stan Wawrinka was unable to follow up his first-round defeat of sixth seed Grigor Dimitrov when he lost 6-7 (7), 3-6, 6-7 (6) to Italian qualifier Thomas Fabbiano. Australian 17th seed Ashleigh Barty reached the third round for the first time with a 6-4, 7-5 win over fellow ex-Wimbledon junior champion Eugenie Bouchard. Women’s top seed and French Open champion Simona Halep, a semifinalist in 2014 and a quarter-finalist in the last two years, then beat China’s 126-ranked Zheng Saisai 7-5, 6-0.